Needing a rose with a special meaning? We have you covered! There is a rose named for almost any occasion. 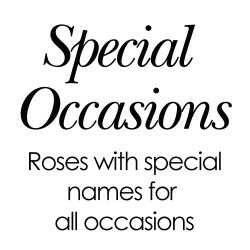 Whether it be a wedding, birthday, anniversary or thank you present, or rememberence to a friend, family member or pet, you will be able to find that special rose from the list below. (Auswhirl) - Large cupped blooms of a lovely rich yellow which pale as they age and are produced in ..
(Benminn) - These beautifully formed large miniture exhibition blooms of mid pink are produced in fl..
(Benwfig) - An abundance of pure white blooms produced in even clusters, may have a tinge of pink du..
(Hybrid Musk 1937) -Very large clusters. Small, single, bright soft pink, white eye. Growth to 3m. R..
(Meisonver) - A stylish, classic rose of great beauty and richness. Vibrant blooms of deep, hot plum..
Profuse blooming medium sized flowers of a very delicate pink shade produced singly and in clusters ..
(Gene) - Buff yellow exhibition blooms with a strong fragrance. Vigorous and disease resistant. ..
(Pejambigeye) - The result of cross breeding with Hulthemia Perisca and reminiscent of an oriental p..